This educational article is of value to artists planning to paint a mural in a public location. It is also invaluable for public offices and departments planning to place public art. Fine Art Conservation Laboratories (FACL, Inc.) has a 3 year contract with the Los Angeles Department of Cultural Affairs to consult, advise and offer art/painting/mural conservation services. See other background materials in the navigation bar of this webpage. We are available to discuss with you your projects. See contact info at the end of this article. 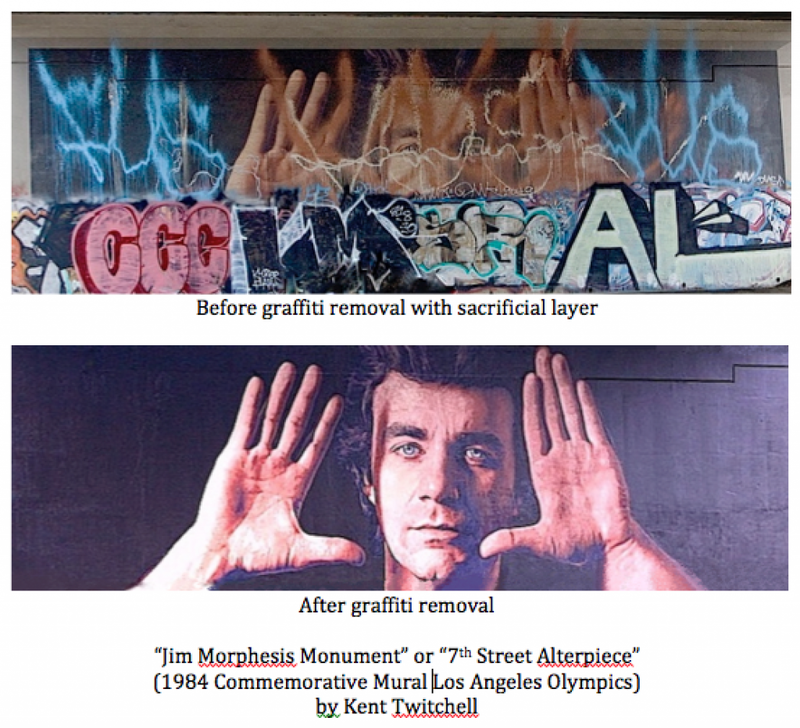 Protecting murals from graffiti is an essential part of the pre-planning of a new mural in a public place. Even if the mural seems out of the way or out of reach, vandals find ways of shooting the paint. The graffiti on this mural goes up about 20 feet. Before we can discuss the types of protective varnish to use, you need to understand the premise for choice. In the professional mural conservation field, when asked how long should art last, we think in terms of “generations.” Murals are part of a community’s heritage, part of the architecture, part of a community’s vibe and culture. They are not just a decoration. This means, also, that anything we do to the mural should be reversible or safely removable in the future… even distant future. Here lies the conundrum: Murals painted in acrylic paint remain very soluble-dissolvable (Keim and oil to a lesser degree but still…) forever. So, cleaning with anything except water is a problem. Of course, very little of the stuff sprayed, spilled or deposited on murals is cleanable-removable in water. Solvents and citrus based strippers used to remove graffiti also attack-remove the original paint. 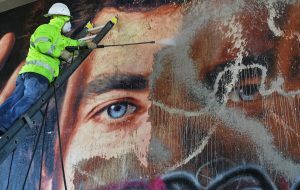 In other words, ANYTHING that is used to varnish the mural, will become part of the mural because it cannot be removed safely (for the artwork). So, let that idea percolate for a moment… if the varnish yellows, that will be the look of the mural in the future and there will be no way possible to remove the yellow. If the varnish cracks and peels (obviously unevenly) then you can’t remove it to redo it later. This photo shows the discoloration of a poor quality protective layers (poor choice). The brownish see-through haze that is being cleaned away is the unstable varnish and wax once used to protect the mural. This discoloration is an unacceptable condition and the very hard resin very hard to remove. Despite this warning or inevitable negative situation, some entities have chosen a hard polyurethane “permanent” protective varnish over a sacrificial layering of removable or “thinnable” varnish. I think their choice is based on ignorance based on the opinions of non-conservation-preservation services within their bureaucratic channels, not because there has been a logical choice . Its a polyurethane topcoat. Here is the link for application instructions. I suppose that because this is a commercial product, that this appeals to bureaucrats. I’ve also been told that some graffiti can be removed from this protective layer with a commercial cleaner called Goo Gone (another long term preservation problem). Here’s a link about this material. The Department of Cultural Affairs chose this material at the recommendation of their graffiti abatement contractor. The photo below shows a brown varnish under the graffiti. This was a permanent hard coating applied over a sacrificial varnish, that was not yellowed or brown. 2. A “sacrificial” varnish layer is one that is applied so thickly that when tagged, the graffiti can be removed along with a layer of varnish without having to remove all the varnish. This means that the cleaning-removal solutions don’t come into contact with the original paint. After the graffiti removal, the surface needs to be re-protected or in other words, the sacrificial varnish layers need to be reapplied. The resin used for the sacrificial layers is not a commercially available product, but can be purchased from conservation suppliers. The resin used is Rohm and Haas’ Paraloid B72. We usually spray apply 4 heavy coats of 15% solids (in xylene solvent). Then we follow up with 4-5 coats of 30% in xylene applied with rollers as thickly as can be possible applied without creating drips. On the mural in the video below, the artist originally thought to apply the thicker sacrificial layer only up on the wall about 8’. But yielded to reason when I showed him the nefarious techniques some vandals use to spray way up high on walls. So, we applied all the layers over the entire mural. This photo shows the before and after of removing a decade of graffiti off of a thick protective sacrificial varnish. Here is a quick video of applying the sacrificial varnish layer to a new mural at street level in Northridge (Los Angeles), CA and a short testimonial for our collaboration. This entry was posted in Consultations, Murals and tagged outdoor mural protection. Bookmark the permalink. Thank you for sharing your knowledge! Over the years I’ve used a variety of paint products and have always questioned the proper way to varnish exterior murals. The Paranoid B72 sounds very similar to Goldens MSA which I’ve used several times. While the MSA is a fine product that contains some UV inhibitors and is sacrificial, it has a bit of delicate quality. I’ve been searching for a protective coating for an upcoming public art mural that is located in a highly trafficked area which is very accessible to potential graffiti. After reading several of your blogs on this subject, and watching some of your videos, Ive got a rough blueprint of the approach. If I’m properly understanding the approach, first a couple layers of B72 are sprayed, and once dried, heavier coats are then rolled. All of this is applied directly to the surface of the mural without an isolation coat? Looking into purchasing Paranoid B72, I’ve found several suppliers with technical information on the product, but have been unable to find an approximate spread rate. With your experience using this product on murals, could you give me an idea of the quantity involved to properly varnish a 2500 sq ft mural and how many passes would be involved? B72 is diluted and removed with xylene or toluene. Acetone works too but it evaporates too quickly. B72 does not offer UV protection, which is a useless trait anyway for outdoor murals. Fading still occurs even with UV inhibitors. I’ve seen B72 turn very gray when applied to murals along a highway with a lot of traffic. General air pollution will not affect this resin more than others. Otherwise, it is a conservation profession vetted material and has been in use as a coating for paintings since the 1960s. 15% solids means 15% solids of B72 with 85% xylene. 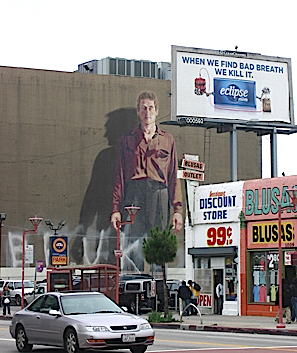 Coating for billboards are not meant to last a long time… only the life of the billboard. A proper application of B72, proper maintenance will give better protection for a longer time. I’ve seen it last decades and it could last longer if it didn’t get tagged, was not in direct sun and was not exposed to water. Resins that dissolve in mineral spirits are A LOT softer than B72 and will have several negative characteristics. Glad to help Barrick. Thanks for leaving a comment. This is good. I like the knowledge sharing. Now I know that I can use sacrificial varnish to remove and also reapply. Thanks for this. Really helpful. That’s my suggestion too. Consider using Paranoid B72 as thick as you can apply in several coats. Thanks for leaving a comment. Hmm. I just learnt a thing about varnishes. I never thought that sacrificial varnish would be more efficient. I mean, I always use the permanent one and the result is not usually great after a while. Maybe I’ll just switch.